Seven years ago, at the urging of one of my cousins, my Dad sat down with my Mother and dictated the story of his experiences in World War II. 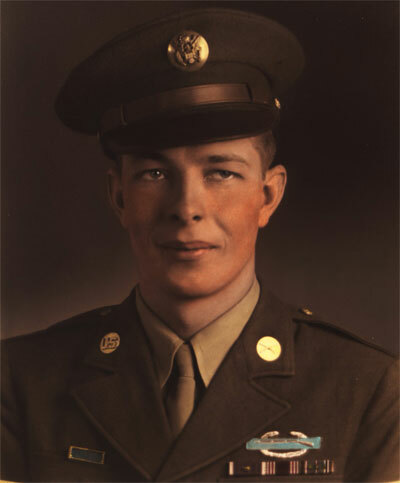 Dad served in the Army as a machine gunner in the European Theater - he and his outfit landed at Normandy Beach shortly after D-Day - and was wounded not once, but twice. He still carries shrapnel in his arm from the second injury, which was inflicted by a German sniper. I thought that on this Veteran's Day, the best way to honor an American who was willing to sacrifice everything for our country is to let him tell his story to a wider audience. Here it is, in unedited fashion, as recorded in October and November, 2004. And thanks, Dad - and all your fellow heroes - for setting an example of humble sacrifice. I graduated from Gainesville High School in May of 1940. I worked as an engine repair mechanic in Gainesville for about one year. I then went to work for Western Auto , where I was employed when I was drafted into the US army in February of 1943. I went to Camp Wolters at Mineral Wells, TX for processing. From there I went into an anti-aircraft outfit at Palacios, TX. I served there for about one year. I was part of a gun crew that tracked planes to be shot down. While there the company was forced to make us march 40 miles. It was terribly hard on us and we decided to complain. The gun crew I was on had ten members. We decided to talk to our commanding officer. He was not much help. We did find out that five of us had an IQ high enough to apply for Officer Training School. We were interviewed by a captain. He looked at me and said, "How old are you?" and I said, "I'm eighteen years, sir." He said, "You are too damned young to be a 2nd Lieutenant." He and I talked and he explained that my IQ was high enough to get into A.S.T.P. (Army Specialized Training Program.) I agreed to try it out. This training was for one year and I would be a 2nd Lieutenant in our engineering company, which would be building roads and bridges. He said I would go to Oklahoma A&M to get this training. I left my anti-aircraft outfit and went to Texas A&M for processing before going to Oklahoma A&M. I stayed at Texas A&M for about two weeks before being sent to Oklahoma A&M, where I was assigned to a company of about 160 men and we lived in a dormitory. We went to class six days a week. We marched to class and to mess hall for meals. I lived in Main Murray Hall. Everything was going well until the middle of January when we were called out one morning and the commanding officer announced, "You are now members of the 104th Infantry Division and you will begin your new duty immediately in the desert, training." My new commanding officer was General Terry Allen, who was active in the African campaign. We trained in the desert in Modesto, California about three months, then the 104th Infantry Division was transferred to Camp Carson, Colorado, for additional training. I had a 30 caliber machine gun as my weapon. I loved that weapon and when we fired for record, I fired a perfect score. I was a PFC (Private First Class). We went on maneuvers (a large-scale tactical exercise carried out under simulated conditions of war) and I had my first accident. My job was to cut off a column of troops going uphill in a ravine and I ran down to cut them off, but when I got to the ravine I saw it was too wide and too deep and I could not stop so I tried to jump across. I made it to the other side but fell to the bottom of the ravine. When I fell, the machine gun hit the arch of my right foot and broke a bone in my foot. That cost me two weeks in the hospital. I knew that we were going to be shipped out to Europe and the invasion of France was on schedule...I was afraid I would miss going overseas, so I aggravated everyone in the hospital to let me get back to my outfit. The lieutenant finally got tired of my griping and he released me back to my outfit. I could walk with a slight limp and was assigned to barracks orderly duty. While stationed at Camp Carson, I was one of three soldiers who set a record by climbing to the top of Pike's Peak and back down in one day. We were in good shape. We tried to get to the top in time to ride the train down..well, we missed the train by about five minutes, so we had to return to the bottom of the climb. We made it down. I had blisters on my feet and my buddies had blood in their shoes. The M.P. 's (Military Police) caught us when we got to the bottom. After questioning us, they hauled us to our barracks and dropped us off. Our commanding officer recognized our injuries and assigned us to the barracks until we could work again. 1944 - The 104th Infantry Division finally went to Fort Dix, New Jersey. We stayed there a few days getting ready to leave the United States of America. The invasion of France had just started and we knew we would not be going to England, but would go directly into France at Omaha Beach, directly from USA. I and my machine gun fought in the hedgerows in Normandy and St. Lou. We could not go down a road because they were mined and the Germans had a habit of striking the road by aircraft. We followed the American tanks as they cleared paths through the hedgerows. Our company had two machine guns. I had one, and the other machine gunner was an Indian from Arizona. We were a good team. We moved into central France and finally got relief to go to Paris for a few days. The F Company, the one I was a part of, rode a train loaded with five gallon containers filled with gas. For some reason, we stopped on our way to Paris, and we noticed a number of French citizens near the train. We thought everything was O.K., but we decided to check ..and found the French were busy taking the cans of gasoline and stacking them between the rails. We rounded up the French and made them place the cans back on our train. We got to Versailles, then decided to go into Paris. We stayed at the St. Mark's Hotel in Paris, which was nice, hot showers, soft beds, cheap food and French girls! We ate and partied at a restaurant, and had a big time for about a week. We discovered where the officer's mess was, so we went early in the morning to eat free and ate up all the food that was prepared for the officer's. Another trick we learned was to watch where our waitress went to get wine when we ran out; we soon saw her go downstairs and return with a bottle of wine. Later we kept her occupied while one of the group went downstairs and came back with several bottles of wine at no charge. When we left Paris we were stationed in the Maginot line across the river from the Siegfried line. We stayed there about a week. The Maginot line was a series of bunkers and the Germans had every entrance zeroed in with mortar fire. We had strict orders to not stand in the openings to our quarters because we would attract German artillery. The Germans were noisy people at night, so we played a trick on them. The 415th Regiment (Timber Wolf) had at least two soldiers who could howl like a wolf. Around ten o'clock at night one soldier would howl, then another, then another. Everything on the German side became quiet and then they would set off flares to see what we were up to. This would go on every night while we were in the Maginot line. The 104th division moved through France, fighting Germans. One day we filled fox holes that had American GI's that had been killed. We were under fire from time to time and could not locate the Germans. We saw a number of haystacks. We had a meeting and decided to fire tracer bullets into the haystacks, when we did, the haystacks caught fire. This brought the Germans out and the infantry killed all of them. The 104th division moved out through Belgium. The people in this country were very nice to American soldiers. We were invited to spend the night in their homes. We enjoyed their hospitality for good home-cooked food. We left there and moved into Holland. In Holland I received a wound in my right foot from an 88 shell. The shell landed behind me and exploded. I was digging my fox hole and crawling in as I was digging. The 88 shell landed behind me and dirt covered me up completely. My buddies thought I had been killed; they were happy and shouted when they saw me come up out of the dirt. This is when I received my first purple heart. The medics wanted me to go back to first aid, but I refused after they removed the shrapnel from my foot. The 88 gun that fired the shell was 2,000 yards away from us. My friends carried my machine gun and ammunition and my pack. We moved from Holland into the Hurtegan Forest in Germany. We dug fox holes and spent two nights in them. The first day was spent aggravating Germans along a road 500 yards from our position. We ran about ten Germans into a rock house, where we attempted to shoot them, but we did not have the right guns for the job. One soldier, who was on a 155mm gun, came up to see what was going on and he said he would take care of it. His 155mm bullet made a direct hit on the house and that was the end of that. The next morning we were preparing to move out when I noticed a new recruit standing under a pine tree. I told him to get into a fox hole because the Germans were near. He refused and a few minutes later I saw him fall. He was dead from a sniper's bullet. I was busy putting my pack on when I felt something hit my left side. The sniper had shot me. I did not lose consciousness. We located where the sniper was, and one of my buddies fired my machine gun until the sniper fell out of the tree where he was hiding. The Germans began firing artillery while the wounded and dead were being taken care of by our soldiers. The medics were picking up dead GI's when the Lieutenant said, "Here is a live one..take him back to the medics." They loaded me onto the stretcher and carried me back., and at one time, they dropped me. I warned them if they dropped me again I would shoot them with my 45 pistol. We arrived at the medics, and there they cut my clothes off and were amazed at the damage the bullet had made. It was strange, but I felt no pain...I was probably in shock. The bullet had severed the tendons of my two middle fingers of my left hand. It shattered the bone in my upper arm, between the elbow and my left shoulder. The bullet stayed embedded in the muscle in the back of my left arm, where it still remains to this day. It destroyed the nerve of my left arm. I was told later by the medics that a German POW doctor put the bones back together as well as he could. I was shipped to a hospital in Paris for another operation, after which I was shipped to England for a period of time, and I had another surgery there. While in England, I was in a ward with about one hundred wounded soldiers. I remember talking to a soldier in the bed next to mine. He had wounds to both arms. We looked around and every soldier, except the two of us, had one or two limbs amputated. I could get out of my bed, so I went to the doctor's office where he told me that we were in the amputation ward. That excited me, but the doctor told me that I would make it without losing my arm, and the soldier next to me would not have to suffer an amputation, either. I remained in the hospital for a couple of weeks before the doctor came around to tell me that I would be shipped to Scotland, and from there I would be flying back to the United States. When we got to Scotland the weather was bad and the officer in charge came by and said all that were able to walk would travel by ship, and all of the "litter patients" would travel by plane. Needless to say, I became a "litter patient" and would be flying back to the USA. The medics carried me on a stretcher onto the plane. When we arrived in New York, I was carried on a stretcher from the plane, and to my bed at the hospital. I thought they would kill me when I got off my stretcher and crawled into my bed. The next day I was loaded onto another plane and was flown to Modesto, California. En route, we spent the night in Oklahoma City, Oklahoma. The officer in charge came by my cot and said, "Siegmund, I know you are from Gainesville, Texas, so I sure don't want you to leave that bed and try to go to Gainesville." I assured him that I was in no condition to do anything so foolish! When we got to Modesto, I underwent more nerve surgery to repair the damaged nerve in my arm. I was in the hospital about two weeks, and after the surgery, I received full use of my left arm. The tendons to both fingers had been repaired while I was in the hospital in Paris, so they turned out fine. When I left California, I was sent to Fort Sam Houston in San Antonio, Texas for physical therapy. I spent about two months in therapy to strengthen my left arm. In October of 1945, I asked what kind of discharge I would get. The officer said it would be a medical discharge. I told them I wanted a regular discharge, but they told me that I had too much disability for a regular discharge. Well, they sent me back to my ward at Fort Sam Houston. To make a long story short, they sent me back to receive a medical discharge, which I refused again, but I finally did get a regular discharge. I worked for the next six weeks at the Occupational Therapy Center at Fort Sam Houston. On January 10. 1946, I told the person in charge of therapy that I was quitting to go to Texas A&M University to get a degree in Animal Husbandry. I hitchhiked to Texas A&M University and enrolled in Animal Husbandry. The following May I received some good news from the US War Department informing me that I had been awarded a medical discharge and I would be paid disability compensation at 40 per cent level, which I still receive each month. My left arm is strong and I delight in talking to people who want to know how I got wounded, and they all are amazed that I still carry the bullet that did all the damage. To all of our fathers, mothers, brothers and sisters; to Uncles, Aunts, Cousins and friends, who heeded the clarion call to service in times of war and peace. Your sacrifice can not be measured quantitatively nor repaid in kind, but rather with a grateful and loving recognition that you bridged the gap between freedom and tyranny; Hope and hopelessness; and what was right and what was unthinkable. We are forever in your debt as long as we draw breath for we are the progeny of your sacrifice. May we never profane the memories of those who gave it all. God Bless you All and may God continue to Bless this most special parcel of earth. This page contains a single entry by Eric published on November 11, 2011 8:58 AM. "Occupy Wall Street" has local impact was the previous entry in this blog. Laws of Combat is the next entry in this blog.